L&B principals Natasha Lebel and Luc Bouliane at the OneMethod office space. Heading a studio of just eight, Natasha Lebel and Luc Bouliane may seem to hold unlikely seats at the table of notables ushering in a new era of contemporary Canadian design. But then, Lebel & Bouliane is not your average boutique firm. For one thing, they’ve all but ignored a mainstay of modern architecture: the cube. 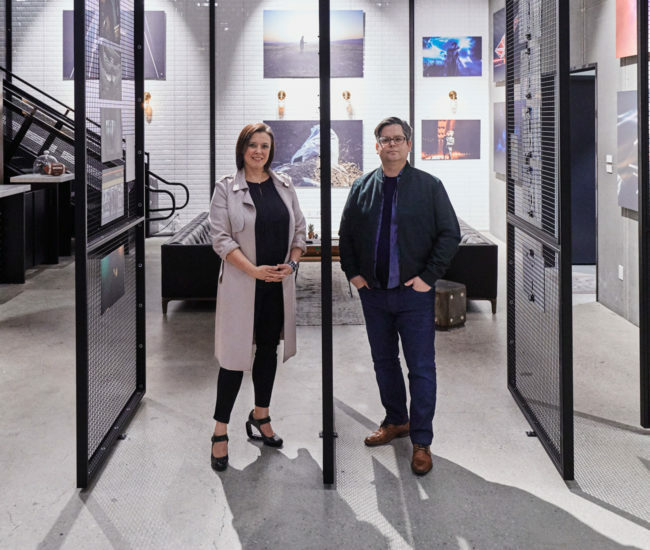 For almost a decade, trapezoids, triangles and faceted surfaces have defined the couple’s portfolio, from a sprawling estate on the Scarborough Bluffs to the marble-edged front desk at Canada’s largest ad agency. 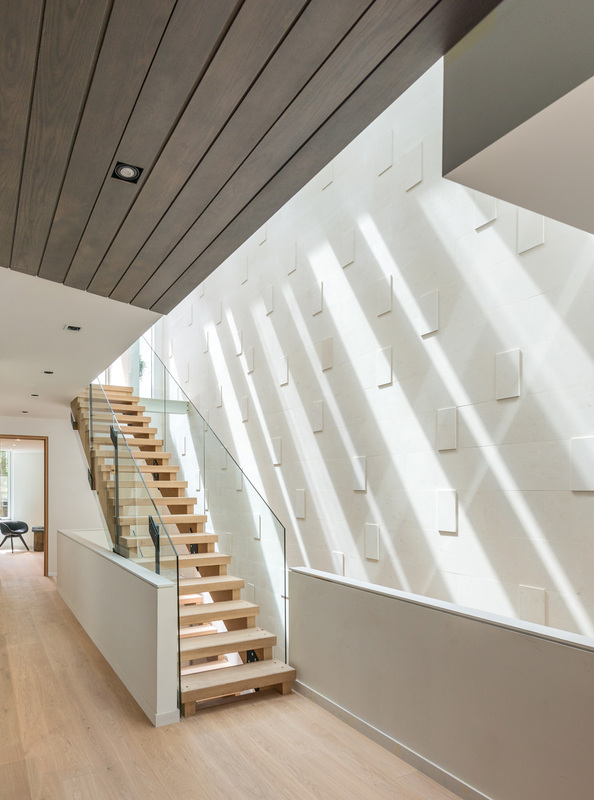 L&B’s award-winning Relmar Houses in Forest Hill actually began with an image of a cracked-open geode – a pebble split down the centre to reveal a prismatic, crystallized interior. 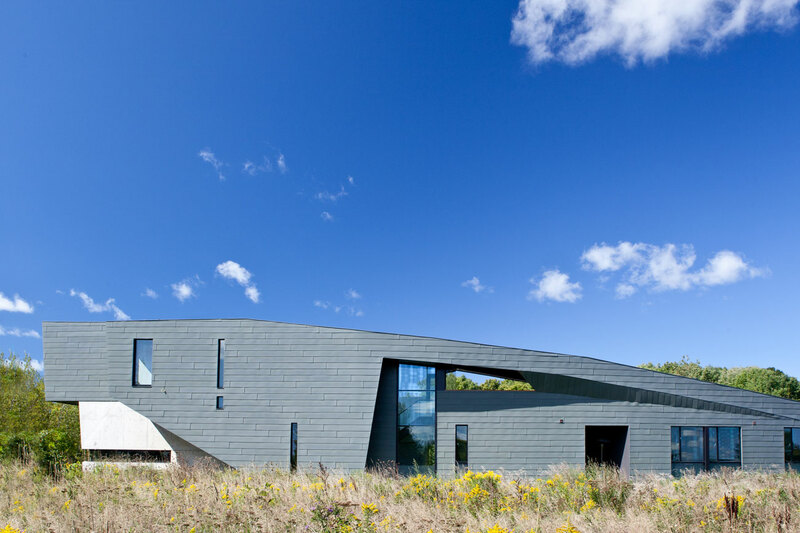 Dubbed Port Hope House, this residential project (designed with Teeple Architects) combines a curved building and complex geometry to open the home up to views of nearby Lake Ontario bluffs. Photo by Bob Gundu. 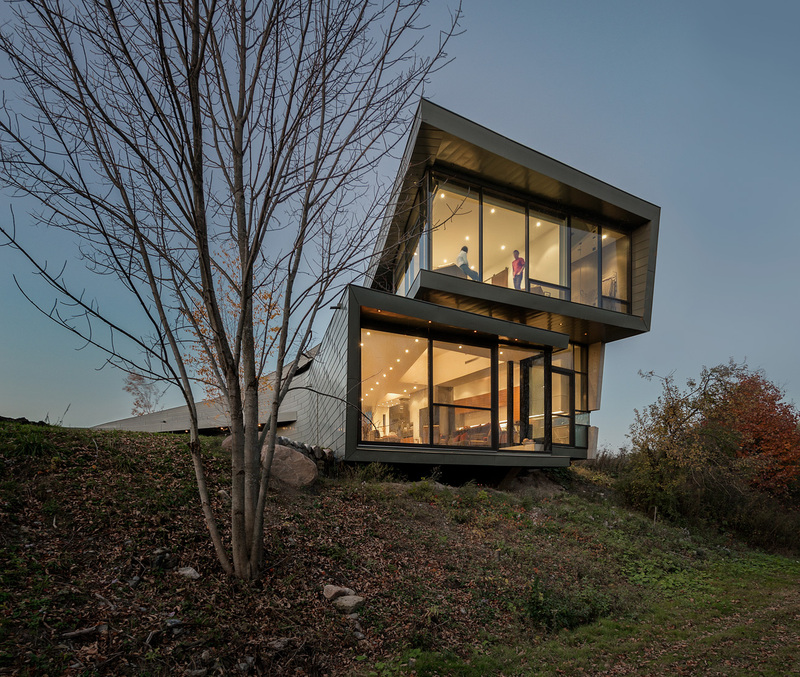 For Bouliane, the principal architect of the studio, that’s the result of growing up in Sault Ste. Marie and soaking in the otherworldly rock formations of the Canadian Shield. The award-winning Relmar Houses project features captivating stone-clad light wells and sculptural age-in-place amenities. Photo by Bob Gundu. No doubt, this playful, aspect-altering experimentation with dimension has become L&B’s signature. For their geode-inspired Relmar Houses, two rectangular homes stretch to the limits of a single city lot, so form had to be carved out within. 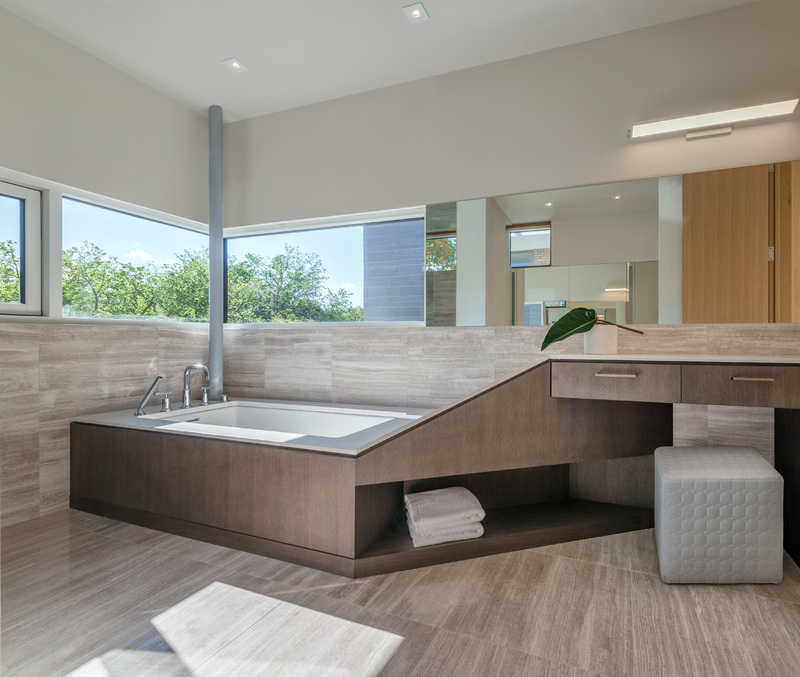 A series of angular rooms, cutaways and millwork defy the conventional floor plate and maximize the circulation of rays from the operable skylights above. 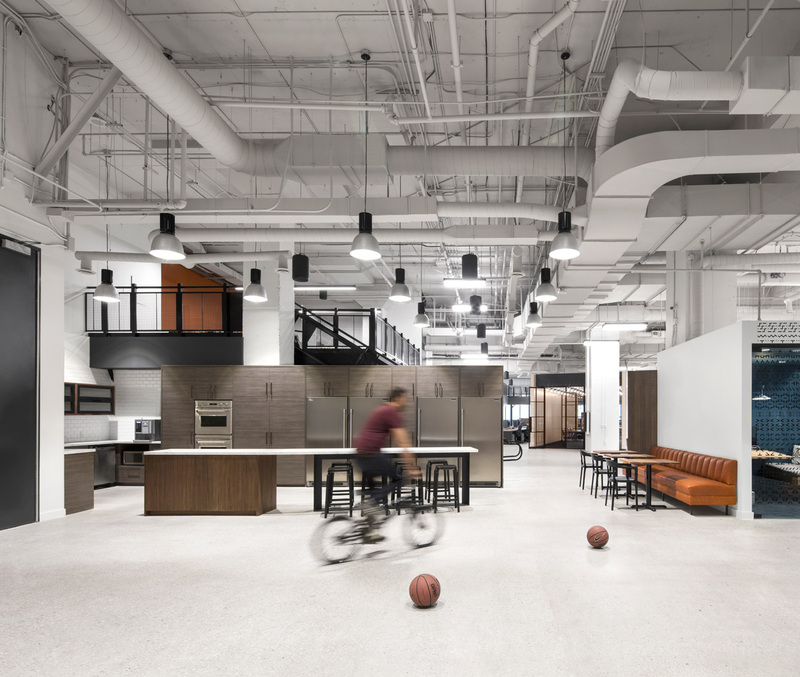 Catwalks, indoor streets and a basketball court – co-designed by Mazen Studio – appoint the 4,650-square-metre Bensimon Byrne and OneMethod office space. Photo by Adrien Williams. Reception desk design by Mazen Studio. Photo by Adrien Williams. Small but nimble, L&B has opted to sit out the condo boom to helm some of the city’s most exciting adaptive reuse projects. 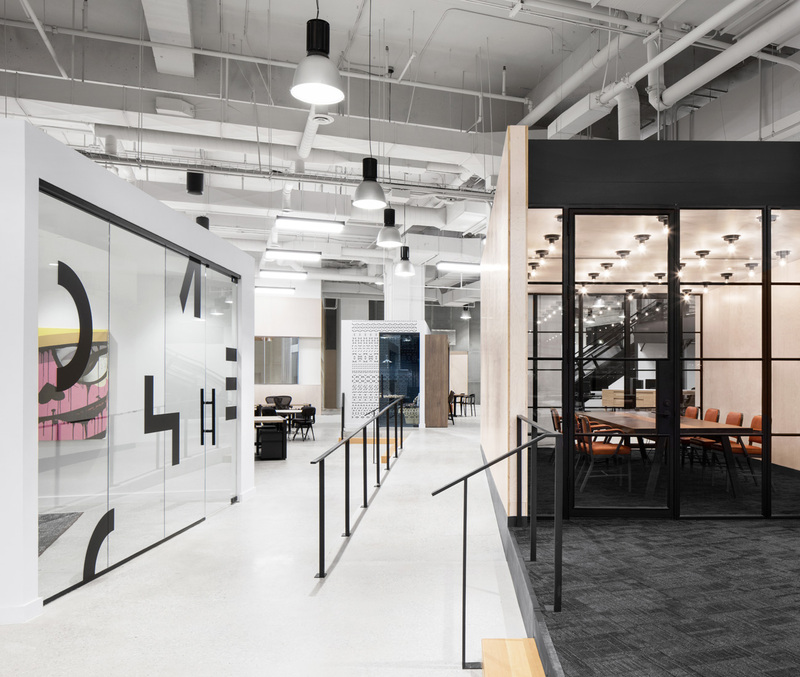 In 2017, creative agency OneMethod commissioned Lebel & Bouliane and interior designers Mazen Studio to reimagine the interior of their 4,650-square-metre space in the iconic Philip Johnson–designed Canadian Broadcasting Centre. 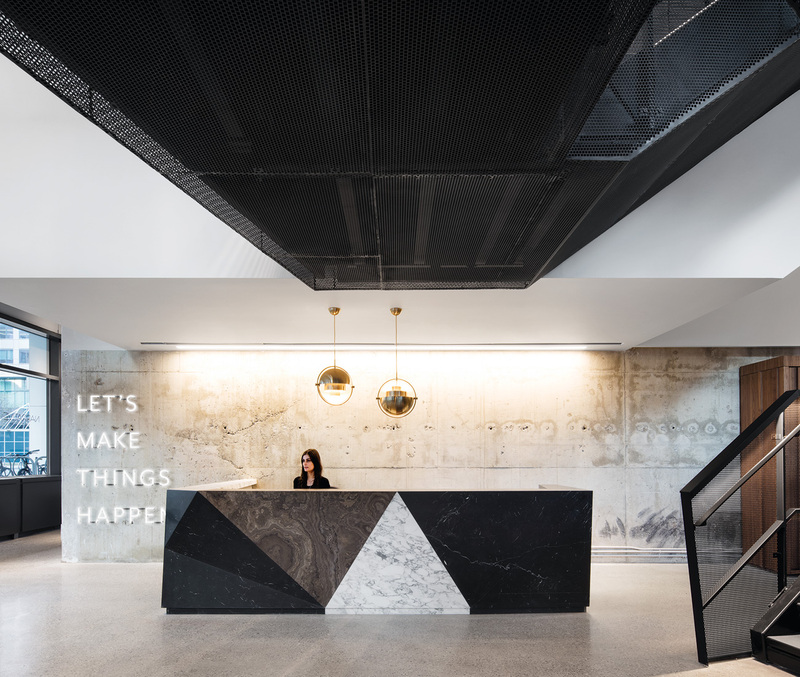 With 8.5-metre ceilings, the two-floor tabula rasa begged for dramatic, large-scale elements to divide the space, which was to be shared with sibling companies Bensimon Byrne and Narrative PR. Interior designed and furnished by Mazen Studio. Photo by Adrien Williams. 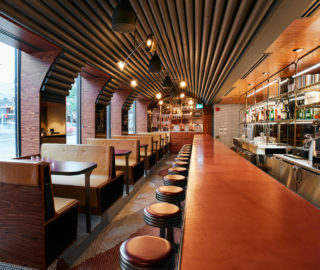 Employing urban planning strategies (and Guy Debord and the Situationists’ concept of psychogeographic mapping), indoor streets, bridges and bleachers consign each agency to its own “neighbourhood.” The firms are united by a series of hospitality-inspired common spaces co-designed with Mazen Studio, including a café–bar and an indoor basketball court. 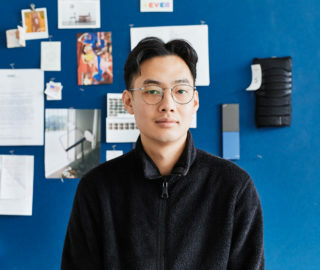 L&B transformed a derelict fish processing plant in the Portlands into the new headquarters of Sidewalk Labs in Toronto. Photo by Adrien Williams. Architecturally speaking, it’s not easy to make an empty warehouse feel polished or cultured or built for a multi-faceted community, but this is perhaps among L&B’s greatest strengths as a firm. Leveraging the same placemaking approaches as it did for OneMethod, L&B transformed a former fish factory into a home for the much buzzed-about Sidewalk Labs, the avante-garde headquarters where Google’s parent company Alphabet is working with Waterfront Toronto to reimagine a strip of the lakeshore in the East End. 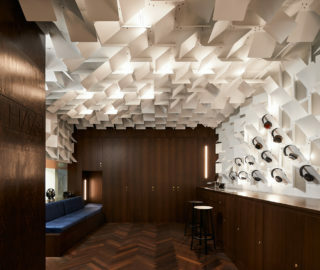 Upon entry, a dramatic volume reminiscent of a ship’s hull mediates office and group areas. 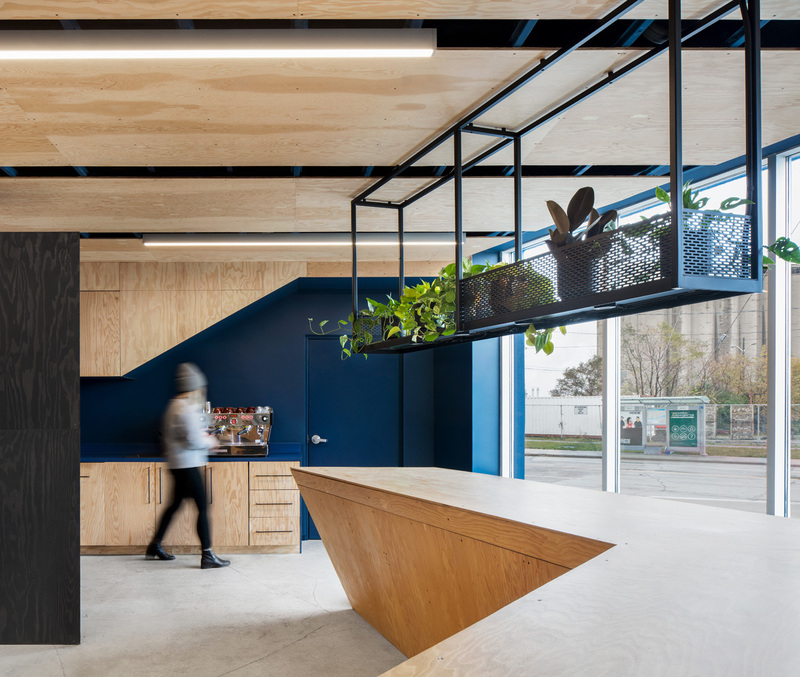 Meanwhile, a raised floor treatment of hexagonal plywood ushers visitors into an open community space. 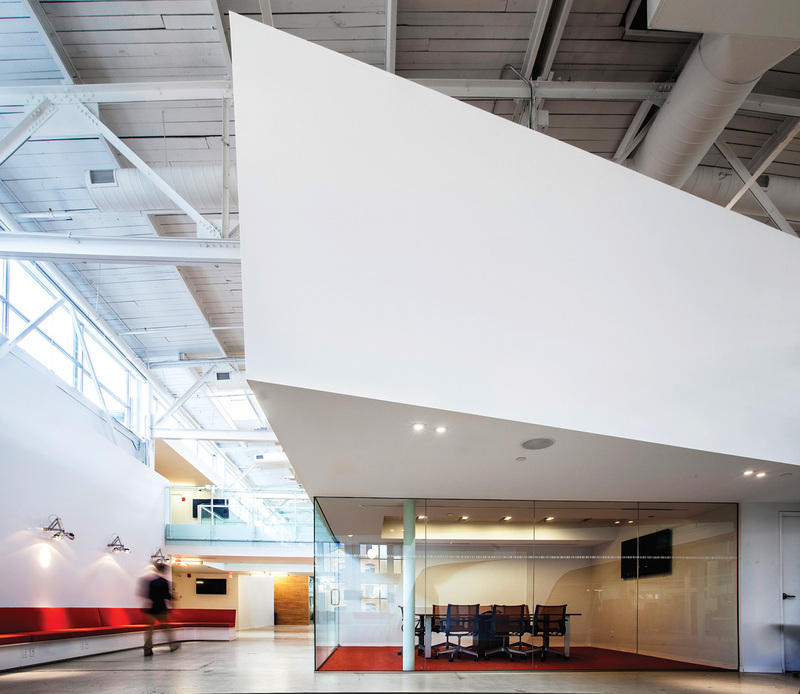 For Cossette, L&B (with Teeple Architects) inserted ship-shaped office “pods” into a historical building in Liberty Village. Photo by Scott Norsworthy. 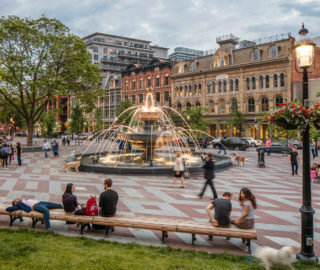 In the coming year, L&B will revamp a slew of historical buildings across Toronto, including projects in the Distillery and at the University of Toronto. And by infusing their residential and commercial tactics into the design of museums, libraries and academic sites, the firm is breathing new life into the city’s institutional architecture – which is often pigeonholed by red tape and procurement rules. No matter. That’s what it means to think outside the cube. 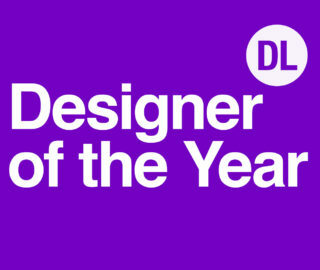 Originally published in our Designer of the Year 2019 issue as Lebel & Bouliane.